Only at the grey or purple shops, guys. Fancy that delicious looking red Classic Controller Pro pack for the upcoming Xenoblade Chronicles? You'll need to place a pre-order at GAME or Gamestation, then. Nintendo just announced the pack is exclusive to GAME Group stores and only for customers who pre-order before 2nd September. The bundle contains the game, red Classic Controller Pro and three posters "electronically signed" — read: signature is printed — by Monolith Soft's Tetsuya Takahashi. If you're in North America and want to make your desire for Xenoblade heard, our friends over at Operation Rainfall have a plan. 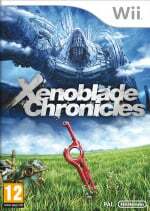 Xenoblade Chronicles takes you to the stunning lands of Bionis and Mechonis. The landscapes are vast, offering over 100 hours of immersive gameplay. Whatever you see in the distance can be reached giving you real freedom to explore and plot your way around quests. Combat is in real time and you are free to roam the seamless universe without having to endure random encounters making Xenoblade Chronicles a real departure from traditional RPGs. When you purchase the pre-order bundle, you will receive three exclusive concept art posters depicting the vast landscapes and characters of Xenoblade Chronicles all electronically signed by Tetsuya Takahashi himself. 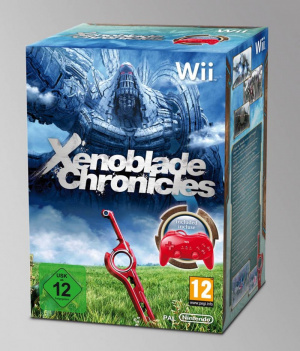 Xenoblade Chronicles is also available to buy or pre-order as software only. To pre-order your copy of the Xenoblade Chronicles bundle and to receive your special pre-order items, place an order with Game or gamestation before the game goes on release across Europe on 2nd September, 2011. To find out more about the game you can now also read Volume 2 of the Iwata Asks series of interviews, providing a behind the scenes look at how the story of Xenoblades Chronicles came together. Visit the Iwata Asks Hub at www.iwataasks.co.uk to read the interview. hmmm none of these stores are in Germany, is this an UK exclusive preorder??? What is worse then DLC shortly after a game is released - exclusive store pre-order content/bonus. Hey, I can't complain about it thogh since I live in the USA and NOA does not want to release this game for who know's why? If the game doesn't get localized, I'll be kicking myself for not importing this bundle while I have the chance. By the way, does the game require a classic controller? It just occurred to me that I haven't heard anything about the controls. Preordering, no doubt about it! Defo getting this though, guv. Psh. I'll stick with Amazon, thanks. I just punched a wall. Their is a dent in the wall because of this game. @MAddogz You already saw the press release on the German site. This means the bundle will be available in Germany, too. Unless they made a mistake, but that seems unlikely. I want that red CC Pro. @Rift It can be played with theWiiMote/Nunchuck combo as well as the classic controller. Thinking about it, I'm not aware of a single Wii retail game featuring Classic Controller support that doesn't offer other controller options. Devs just cannot assume everybody owns a classic controller. Anger...rage...all of it and my hate at NoA. If this bundle were not meant to be released in Germany, there wouldn't be an USK rating on it. It's a nice bundle, but any true gamer should already own a CCPro that came with Monster Hunter Tri. Goldeneye better had a gold Wii Zapper. @Traxx Not every 'true gamer' likes Monster hunter and I don't and haven't got a CCpro yet and am hoping to get this bundle. @Rift: I'm 90% sure that it's a requirement for Wii games to offer a control scheme using the Wii remote and nunchuck if needed. I think Nintendo enforces this to lower the entry barrier for people buying new games. I'm thinking of getting this game but not sure whether to pre-order. As I haven't got the CC Pro yet, this bundle is appealing, but I think I'll wait until I find out more about it. @15. Burny: Most of the SNES and N64 VC games require either the CC, or a GameCube controller. I want that so bad. Come to America, dammit!